It's groundbreaking. It's inspiring. It's not just for gardeners . . . If you have any interest at all in Perelandra and Machaelle's research, you will appreciate this book. And if you have never gardened a day in your life, refuse to eat vegetables and really love your plastic houseplants, you will still appreciate this book. Everything you know that has gone into establishing your sense of order, stability and balance, namely logic — in gardening, farming, ranching, landscaping, forestry, lawn management, pond management and in every other area of your life — will be challenged. 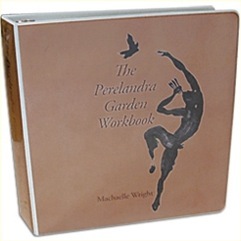 For you see, even though The Perelandra Garden Workbook is presented through the prism of the Perelandra garden, this gardening is a metaphor for the whole of life. As you change how you approach your garden, you will, in turn, change the very fabric of how you approach everything else in your life. View the Table of Contents and an excerpt from the first chapter here (11 mb). "The new Workbook is fabulous. It's laid out more organically and it just flows. The translations seem much clearer for me now. Just about every stumbling block I had before has been cleared up. I am so stoked. Now I really feel like I can do it without being overwhelmed. Big thank you to Machaelle!" With kind permission from Perelandra, Centre for Nature Research. To make this book more affordable, we decided to keep the introduction offer: save £5!